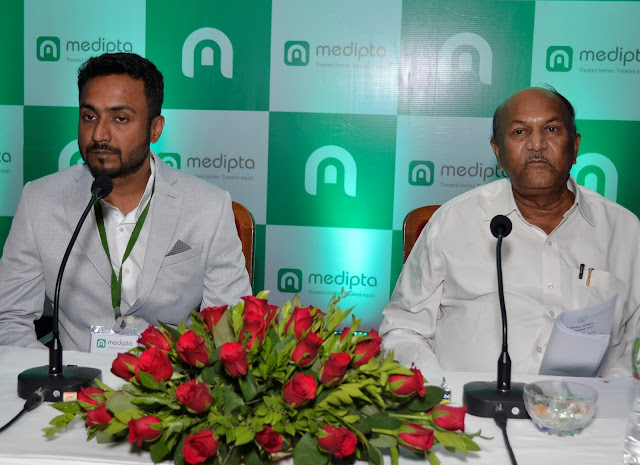 The Maharashtra State Chemists & Druggists Association (MSCDA) & Medipta a medical services aggregator announced their collaboration in the city today. The MSCDA is encouraging & assisting the drug trade industry to promote the development of pharmaceutical sector. Medipta is India’s first such innovative app which connects patients, Doctors, Diagnostic labs and Chemists and every entity in healthcare industry. Minister of State Food & Drug Administration Mr. Madan Yerawar officially launched Medipta in Mumbai today. Mr. Jagannath Shinde President of MSCDA was present during the moment & announced Medipta as a Technology Partner for all Chemists and Druggists around Maharashtra. While addressing media he said, ‘MSCDA intends to channelize the entire pharma logistics into organized manner which will minimize wastage, optimize operating cost and working capital. In collaboration with Medipta all chemists & druggists will become as organized force to strengthen present pharmacy retail chain. Through Medipta they will get opportunity to increase business by connecting people in the same field.’ Online drug supply system is a major threat to all Retailers, Distributors & all allied Medical Services. Medipta will be aggregating all retailers to reach patients in 20 minutes over digital prescription and delivery management software, he added. · Patients in need of any kind of medical guidance or treatment right from medicine reminder system with a pregnancy app too. · All the allied medical services like Labs, Blood Bank, PHCs, Ambulance and Insurance also can be availed through this platform.